Ready for Halloween? Crochet this quick pumpkin hat for your baby, toddler, or child to top off a pumpkin Halloween costume. This hat features ridged lines to create the pumpkin look and texture. Finish off by sewing on the stem. For the creative crocheters, feel free to embroider or sew your own jack-o-lantern face onto the pumpkin hat. This pattern can be downloaded in the Crochet Spot Store. 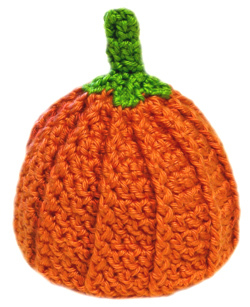 Need help while crocheting your pumpkin hat? Just let me know and I’ll help! This entry was posted on Thursday, September 2nd, 2010 at 6:00 AM by Rachel Choi	and is filed under Best Crochet Patterns. You can follow any responses to this entry through the RSS 2.0 feed. You can leave a response, or trackback from your own site. CUTE! I love it, thank you Rachel! What a cute hat Rachel…You really have some cute patterns!!! I love this pumpkin hat. What a shame we have to buy the pattern as with many of your other patterns. I know we’d like all the patterns to be free, but come on. She only charges a couple of dollars for her patterns. She’s a young mommy, trying to help take care of her kids and stretch her budget This website allows her do that. I know, money is tight. I can’t afford anything right now as I’m out of work. It’s true, a lot of her stuff IS free, but why complain because she charges a couple of dollars for some of her premium patterns. If she wasn’t trying to work, some people would find fault with that too. Go Rachael! You can always try designing your own! Maybe there’s a untapped well of creativity in you just waiting to be unleashed. First of all I live in Australia and I am unable to buy these patterns because of a few reasons which I will not go into. There are a lot of good free patterns on sites but when you come across one that is really good and you have to buy it then I can’t do it. That is all I have to say.